White is the color of mourning in some parts of the world. White is the colors of babies, of baptism, of lambs, of snow. White is the color of marriage and of hospital gowns. White is the color of the hallway as I approach my father’s room and the words of his doctors. White was the color of my brother’s rabbit. In springtime, poverty was less of an issue, but each fall the difficulty grew. With each year, my brother and I felt the pains of our difference, of our otherness, more. Our mother cut our hair and she patched our knees. The brown paper lunch bag she handed me was the same one I returned home the afternoon before. I had not eaten the apple so she might have something to send me with today. For weeks, until it was rotten and could be tolerated no more, we transported this apple back and forth, the three of us—me, my mother, and the brown paper bag—silent in our conspiracy to pretend I was fed. My brother ate his apple on the first day and had nothing to carry until the first of the following month. “They shouldn’t go to school anyway,” my father said. “There’s nothing useful to learn there.” He could say this because all of his education amounted to so few results that it made sense no education was worthwhile. “They don’t teach you useful things—like how to live in the woods. How to love nature!” His fist jutted in the air and he stumbled out the side of our RV-home in search of another beer. His love of nature seemed to mostly reside at the base of a tree amid empty bottles and cans. When it wasn’t raining, my mother rode her bicycle into town and cleaned toilets. She hoarded her dollars and, when Easter morning came around, she shook us awake and told us to come get our daily coffee. My brother thought drinking it made us more like adults, but I liked the way it made my stomach forget. That morning we grumbled, tired from a week of not-learning at school, but she shook us again and then ran to the kitchen, giggling, before our feet had even touched the floor. On the cracked Formica table, she had set out two chocolate bars. Plain for me and with almonds for my brother. My mouth fell open so wide I might have fit the whole bar inside, wrapper and all. “There’s something else,” she said and pointed to the front door. We clutched the chocolates to our chests and ran outside. A wire cage sat in the yard. Inside it, a large white rabbit with strange pink eyes. 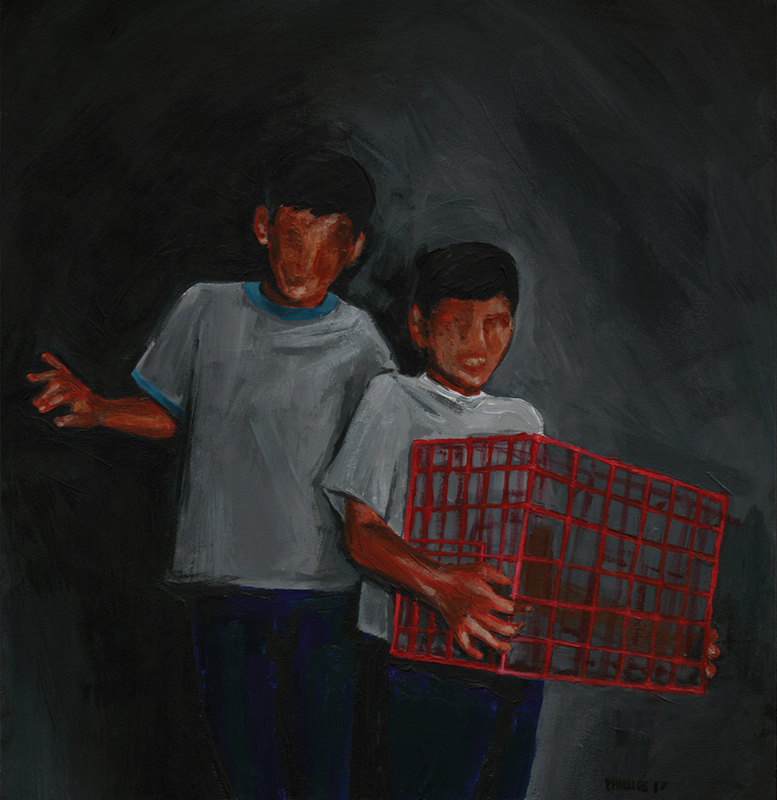 “Can it be mine?” my brother asked, already on his knees, clasping at the cage. “Yes,” I said, before my mother could respond. My mother shrugged and squeezed my shoulder. “Just don’t let it out,” she said. My brother plunged his hand through the cage door and sunk it into the rabbit’s fur. It didn’t seem to mind. My brother ripped at the chocolate wrapper with his teeth, and as I watched him hold the candy in one hand, taking each bite, letting it soften in his mouth before he chewed, and gripping and releasing the rabbit’s fur with his other hand, I thought this might be the best moment he would ever have in life. My father walked up beside me and asked who had the money for a rabbit. “Huh,” my father replied and the perfume of marijuana traveled to me on his breath. The week before Thanksgiving the school teacher handed me a flier. The school lunchroom would be open on the holiday for families who could not afford to have dinner on their own. When I arrived home, I could not find my mother, so I handed my father the flier. “They’ll have two kinds of potatoes,” I said. “With what?” my mother asked as she came into the room. “I said we’ll have it here.” My father’s voice was sharp like an unexpected splinter sliding under a fingernail. On Thanksgiving morning, my brother and I awoke early. The air felt emptier than it should. No coffee scent, but that wasn’t it. “Stay in bed for a while,” my mother whispered from the hall. Somewhere in the yard, we heard a squeal and a snap. “What was that?” my brother asked, but I did not answer him. Now, we were adults. Now, we stood in the cold white hallways of the hospital and again breathed the empty air. My mother sat in his room, beside him. We waited in the hall—silent, obedient boys—still waiting for his order before we took a step, though it had been years, decades, continents, worlds. We stepped into the room. His long, thin body draped in sheets, no longer the burly man of our youth or his. It will be easy to lift his coffin, I thought, and then reeled it back in. We pulled up chairs and sat opposite my mother. She held our father’s hand and wept. At dinner that Thanksgiving, so many worlds before, we had sat around the table and folded our hands. “It’s a small turkey, but it will do,” my father said as we bent our heads, to express our thanks for the bounty before us. The small turkey with four legs and no wings. The small turkey with the heart of a rabbit. Between the words of my father’s prayer, the plink of my brother’s tears sounded on one of our last unbroken plates. 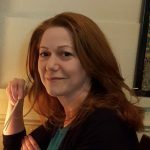 Becca Borawski Jenkins holds an MFA in Cinema-Television Production from USC and has short stories appearing or forthcoming in Menacing Hedge, concis, The Forge, The Journal of Compressed Creative Arts, Syntax & Salt, and Corium. She is also an Associate Flash Fiction Editor at jmww. She and her husband spent the last year living off grid in a remote part of North Idaho, and now roam North America in their RV.